This is an infographic created by Tim Challies that explains some of the different heresies that come out of poor explanations of the Trinity. It’s lack of lizards is noted. You may need to click twice to see it at full screen. This entry was posted in Christianity, Evangelical, Evangelicalism, lds, Mormon, Mormonism, Trinity by Tim. Bookmark the permalink. Tim Challies did his best. His infographic is quite good. For example, I like his statement that “the Son and Holy Spirit are willingly subordinate to [God the Father] in role . . .”—something that has been denied by certain persons contributing to this blog. What’s lacking in the infographic is the fact that “Father,” “Son,” and “God” are words that are not used exactly the same way every time they occur in Scripture. Also, the graph lends no help for someone trying to understand Mormonism. I’d also like to ask those who have studied the graph, Has the Holy Spirit now applied to your heart his understanding of the Trinity or are you still confused? If the person says, “I’m still confused,” then the graph didn’t work. I have a better idea: Read John 17, ask God to give you an understanding of it, and then keep reading it and keep praying until the sunlight (the Trinity) rises in your heart. Seriously Tim, I’m a visual person, so this is really nice to see. Why should it? “Understanding Mormonism” is clearly outside of the infographic’s scope. Then I would recommend Klaus Schatz. I like it. Even without the lizards. 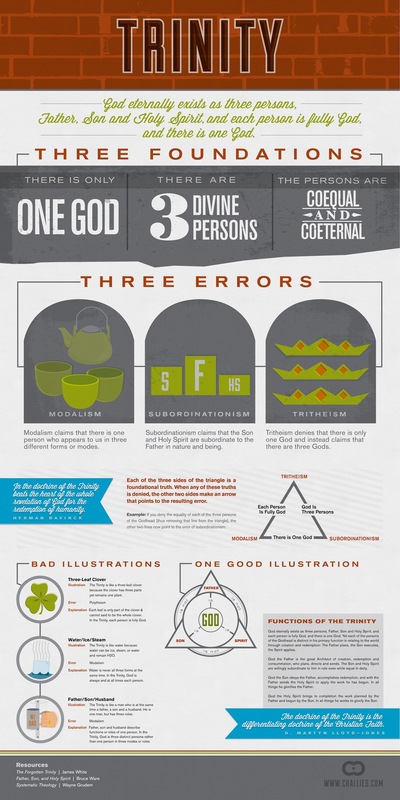 Seeing subordinationism as one of the three major errors alongside tritheism and modalism made me want to fist-pump. Although, I’m confused that Grudem was a source for this. I thought Grudem was a subordinationist. On a day many call March Madness, Jack fist pumps about trinitarian heresies. Sure sign she’s in seminary. I thought Grudem was a subordinationist. Grudem is a subordinationist in denial. He argues for “ontological equality but economic subordination” as a way of asserting he isn’t actually preaching subordinationalism, getting around the heresy. The son for him is subordinate in authority but not in power. I have a post, Wayne Grudem and Heresy which goes into his argument and how it mainly a game based on properties of 21st century English that doesn’t hold up in ancient Greek or Latin. Okay. You got a LOL from me, Tim. Yup. I don’t think I’ve done any new reading on modern-day Trinitarian subordinationism in a while, but that’s about what I recall. Christian J, thanks for the compliment—if it was a compliment. We’ll give God all the glory. I cannot speak to the linguistics of CD-Host’s post except to say that the Westminster Confession was written in English, so the Latin would be a translation not the reverse. I agree that language “eternal subordination of the Son” is problematic. Unfortunately the rhetoric in the debate has become so heated that even the orthodox distinctions of the three Persons of the Trinity have been attacked. In the West it has been common to begin with the one Being, going on to explain the three Persons. In the East it is most common to begin with the three Persons and moving to the one Being. Our Trinitarian theology is always best when neither approach is used to the exclusion of the other. Now there seems to be a new approach to start with the relationships of humankind and to explain the economic/ontological relationship of the Trinity based on complimentarian/egalitarian preferences. On one side you get a complimentarian subordinationism by inserting an authoritarian structure into the mutual indwelling of Trinity. On the other side you get a egalitarian modalism by denying the order (both filiation and mediatorial) that has always been part of Trinitarian theology. Eventually cooler heads will prevail and an agreement will be reached that it is not particularly helpful to explain the order in the Trinity based on human female/male authoritarian structures especially in a post fall world. I cannot remember who said it but someone smarter than me explained that all analogies based on creation used to explain the Trinity trend to one heresy or the other. This one is no different. I cannot speak to the linguistics of CD-Host’s post except to say that the Westminster Confession was written in English, so the Latin would be a translation not the reverse. Secundum hoc iam potest intellegi non tantum ideo dici missus filius quia uerbum caro factum est, sed ideo missus ut uerbum caro fieret et per praesentiam corporalem illa quae scripta sunt operaretur, id est ut non tantum homo missus intellegatur quod uerbum factum est, sed et uerbum missum ut homo fieret quia non secundum imparem potestatem uel substantiam uel aliquid quod in eo patri non sit aequale missus est, sed secundum id quod filius a patre est, non pater a filio. (translation) And according to this manner we can now understand that the Son is not only said to have been sent because the Word was made flesh, but therefore sent that the Word might be made flesh, and that He might perform through His bodily presence those things which were written; that is, that not only is He understood to have been sent as man, which the Word was made but the Word, too, was sent that it might be made man; because He was not sent in respect to any inequality of power, or substance, or anything that in Him was not equal to the Father; but in respect to this, that the Son is from the Father, not the Father from the Son. This is not (if one accepts the historical creeds) an acceptable opinion. This is not a problem with a bad analogy Wayne Grudem is being unequivocal that the Son is not equal to the father in ἐξουσίαν. He says it directly, he isn’t implying it through some analogy or metaphor he is saying it outright. And in saying so he is contradicting the historic creeds and contradicting historic teaching on this issue. Yes, Wayne Grudem really and truly is preaching Arianism. I think egalitarians have every right to consider this more than just a bad analogy and instead an outright unrepentant heresy. And by a guy who was a major influence on the direction of the ESV and who wrote one of the more popular systematic theologies. I do agree with that analogies tend towards heresies and that’s a problem with the trinity being gibberish. But if you actually believe in this doctrine, in its historic sense, Grudem’s position is unacceptable. Todd I clicked on your link and noticed your post on baptism for the dead. did and still do practice it. Marcion (the inventor of the New Testament) who certainly read Paul practiced it. And the Synod of Hippo (in 393) had to specifically rule against it. If Baptism of the dead is so clear cut, why was there so much confusion on the issue? If I might suggest an even earlier reference to restitution for the dead: 2 Maccabees 12:43-46. The Mandaeans reject Jesus, so what in the world do they have to do with Baptism for the Dead in a Christian context? The Copts (Egyptian Christians) did and still do practice it. So he has textual evidence for the practice among the Copts in antiquity (which he doesn’t share) and admits that there is no documentation for it as a modern practice. But he knows someone who is a Copt who knows it happens; that’s the evidence for practice among the Copts? Sorry, that doesn’t cut it. By that logic, I know of faithful attending LDS Mormons who also practice polygamy, they just keep it on the down low (perhaps Monson has asked them to keep it private?). Therefore, Mormons practice polygamy. I can even go one better than Tvedtnes and cite D&C 132 as documentation that it does happen. Sorry, this is more “proof” by innuendo and suggestion that FARMS/FAIR practice so well. Marcion (the inventor of the New Testament) who certainly read Paul practiced it. Who cares. Marcion also rejected the Old Testament and considered the god of the Old Testament to be evil. And what is it with your obsession with Marcion? And the Synod of Hippo (in 393) had to specifically rule against it. And why did they do that? Let me guess, evil bishops wanted to hurry the Great Apostasy along. If Baptism of the dead is so clear cut, why was there so much confusion on the issue? It is a dubious practice based on a confusing aside in 1 Corinthians and totals exactly one verse. I fully admit that the best translation shows that the practice defintely concered some sort of proxy baptism. But beyond that it says nothing, other than as some sort of evidence for the resurrection. Paul doesn’t give a rationale for it. He doesn’t condemn or praise it. He never develops it as a theme. I can think up reasons as to why Paul might have thought it was a good thing to do, reasons why he thought it was a bad thing to do (he had bigger fish to fry in 1 Cor), and reasons as to why he was indifferent to the practice. If I had to guess, I’d pick the latter, indifference, but it’s only a guess. If I might suggest an even earlier reference to restitution for the dead: 2 Maccabees 12:43-46. First, now I’m fairly certain you are just copying and pasting from Tvedtnes. There is no 2 Maccabees 12:46, the chapter ends at verse 45. I just double checked this in my Oxford Annotated Study Bible and in my copy of Rahlfs-Hanhard Septuaginta. Yet, you somehow make the same mistake as Tvedtnes who also incorrectly cites the passage as 2 Maccabees 12:43-46. A small piece of advice, triple check everything Tvedtnes writes. Second, the larger passage (2 Maccabees 12:39-45) merely concerns two things 1) praying for the dead and 2) taking up a collection to offer a sin offering at the temple. This passage is also used as scriptural evidence by Catholics for purgatory, prayers for the dead, and formerly masses for the dead. So yes, there is evidence that there was a belief in some kind of proxy help for those who are dead. But again, just like in 1 Cor 15:29, the main point of the passage (summarized in v. 44) is the belief in a resurrection. It’s quite a leap from that to either the late medieval Catholic belief in necessity of saying masses for the dead or the Mormon conception of the necessity of baptism for the dead. If you do have any evidence for Coptic practice of baptism for the dead, I’d like to see it. My bible study class will be covering 1 Cor 15 on Thursday, and I’m fairly certain baptism for the dead will come up because it has been in the news recently. Since I’m the ex-Mormon in the class, I’m sure I’ll be the one explaining/defending the Mormons. If there is good evidence for Coptic practices of baptism for the dead, I’d like to see it, it will help the Mormon practice sound less weird to outsiders. Hey Jack, what you said to “Why Me” was hysterical. Katyjane, I know you never come here any more but I love your Oliver stories. David, perhaps celestial and terrestrial may come up in the study, too? And when I think of LDS terrestrial, telestial, and celestial, it brings me back full circle to how the Trinity is related to heaven. The Trinity is heaven. Just teasing you CD. Feel free to comment with a copy and paste from Wikipedia anytime you want on whatever it is on your heart. We’re here for you. Yep I did grab references from the FAIR article. Baptism for the dead is not exactly a topic that comes up much in a non Mormon context. I was looking for a quick set of examples. I have Lupieri’s book on the Mandaeans which does discuss Baptism for the dead briefly and its theological meaning. The reason they are relevant is that one of the primary origins of Christianity is Essene community that John led, the Mandaeans are a good independent source of information for what early proto-Christianity may have looked like. Their literature, their beliefs and their practices, created a semi-independent source of information. Richard Reitzenstein is a scholar who worked on this issues. Mormonism believes a great apostasy occurred that the Christianity that exists today was perverted from the very early teachings of the first Christians. So do the Mandaeans and so do the scholars who think of Mandaeans as having preserved a Christianity that is closer to the Palestinian proto-Christianity of the ancient world. Yes they reject Jesus / Paul, because those are Christian symbols. If they weren’t Christian rejectionists they never would have survived to be an independent source, they would have just melded into the Catholic church like rain over the ocean. Because they did reject, Mandaeans represent the tree before the specific savior is chosen when parts of what will become Jesus are still scattered among: John the Baptist, Seth, Melchizedek, Sophia… Mormons aim to complete Joseph Smith project, and restore first century Christianity. Anyone who is serious about that can’t help but treat Mandaean sources as important. Actually Marcion did not consider the god of the Old Testament evil, he consider him just but inferior to the God of Jesus. We are talking Mormons here who hold to a hierarchy of Gods, so Marcion’s theology in this regard isn’t too dissimilar to LDS theology. Again Marcion is someone Mormons should look to as a source of information / inspiration. As for my “obsession” with Marcion, it is because we regularly talk about early Christianity and Marcion is going to come up regularly in most discussions about 2nd century Christianity. Marcion is one of the top 10 most influential people on forming Christianity, including your Methodist Christianity. As for your refutation on the Copts. Point taken. If the living are capable of providing spiritual aid to the dead through ritual you pretty much have concede the main point, that spiritual work can in some vague sense be assisted by proxy. Then it just becomes a question of details. Since we know proxy baptism was one of those proxy services, i.e. one of the details in question that did happen during the early world my original point is agreed to. In terms of necessity I would agree with you that there is no evidence for the necessity of masses for the dead. But this is going to quickly get into the very well worn area of the mechanism of justification and the arguments between Catholics and Protestants and in general I think the bible is a contradictory mess but the bulk of the evidence supports the Catholics on justification. If we assume people are justified by faith and works and not sola fide and these works can be performed by proxy I’m not sure what’s so troubling about Baptism for the dead. As an aside on your second post this is the direction I’d go in your discusion. Indulgences, masses for the dead, …. are practices that western protestants can understand. The other thing is Mormons are rather unique in their understanding of Baptism. Very few Christian sects believe in credobaptism and baptismal regeneration. Paedobaptism / baptismal regeneration is where I’d start. The defense for that being effectual doesn’t make proxy a huge step. As for Credobaptism consider someone who requested a baptism but was too ill to go to running water and stand be baptized. They might do something symbolic like have water splashed on their head or ask someone to go in their place to symbolize them. The only remaining issue is whether the dead and not just the seriously ill can request their relatives perform this service. Just teasing you CD. Feel free to comment with a copy and paste from Wikipedia anytime you want on whatever it is on your heart. Anyway you are right, to complain about me bringing baptism of the dead to this thread. The real reason is rather mundane. I clicked on Todd’s name saw the article on his blog and was thinking about the connection between sects that practiced Baptism for the Dead and sects that believed in non-trinitarian Christology. Think about your “why was Jesus baptized thread” and the discussion on it. I was trying to find the citation for Cerinthus practicing Baptism for the dead hit the FAIR article with lots of ones I didn’t know about including the 393 church council reference which floored/distracted me. But I didn’t see any evidence that Cerinthus tied his belief in baptism for the dead back to adoptionism. So yes I plead guilty. This was a nasty thread jack caused by me looking for a connection and getting distracted and just responding quickly. Incidentally David, if you want the original point and one not from the FAIR article this Cerinthus one counts from Adolf Hilgenfeld’s Fetzergechichte des Unchristentums & Levy’s Les Evangeiles et la seconde generation chretienne. The Levy article BTW is frequently cited by LDS apologists like Hugh Nibley. If your going to make a provocative claim there needs to bear at least a semblance of reality. I’m not 100% sure if I believe the doctrine of the Trinity, but it is very appealing and resonant. It tastes good to me. whatever your heart says in contrast is right no need to elaborate the truth has no reson for petty words only action of now.